Face sprays have been an essential part of my skincare routine for quite some time now, but I don’t think many people actually use them. At least, I never hear many people talking about them and I think that’s why I would write a blog post about why I love them and why I think you might love them too. A face spray has been something I love using, not as most people will tell you to use it: on top of my makeup, but I use it as part of my skincare routine. I love using face mists that promise to be refreshing and hydrating at the same time. I do not use these to extend or prime my makeup: I solely use them as I feel they add some much needed moisture back into my skin. You can of course use a face mist to freshen up throughout the day. However, I wear a full face of makeup on long days and just don’t see how it works. I will use a setting spray to set my makeup, but a refreshing face mist mostly just messes with my makeup. It usually makes my makeup look splotchy as the mists are not fine enough and add too much moisture and just breaks up the powder and foundation I am already wearing. No, I like using a face spray on freshly cleansed skin in the morning. My skin needs all the hydration it can get and I find that a face spritz is a great way to add extra moisture without too much hassle. I cleanse my skin in the morning with some micellar water, which works best with my sensitive skin. Do may hair and then use a face spray. I will then have breakfast and apply my actual moisturizer after that. In a way you could say that I use my face sprays as a type of serum. I find that an actual serum or face oil is a great thing to use in my night time skincare routine, but I find them too rich when I also want to wear makeup. So I was looking for a product that could act as a serum, give lots of hydration, but without running the risk of my makeup pilling right off my face. Face mists are a product that was introduced through Korean beauty routines (what skincare fad isn’t?). The belief is that a face mists adds a layer of hydration and should help absorb any skincare you apply on top. There is a reason why Korean beauty routines often also include a skin essence which has exactly that purpose too. However, a face spritz is so much easier to use. You cleanse, you spritz, you moisturize. Easy as pie. I have found that having used a product like this for some time, my skin is just feeling much better and it’s a step I love in my morning routine. The spray feels refreshing and instantly wakes me up. The three sprays I show in the picture above are all great examples of face sprays that give you that instant yup-I’m-awake feel. 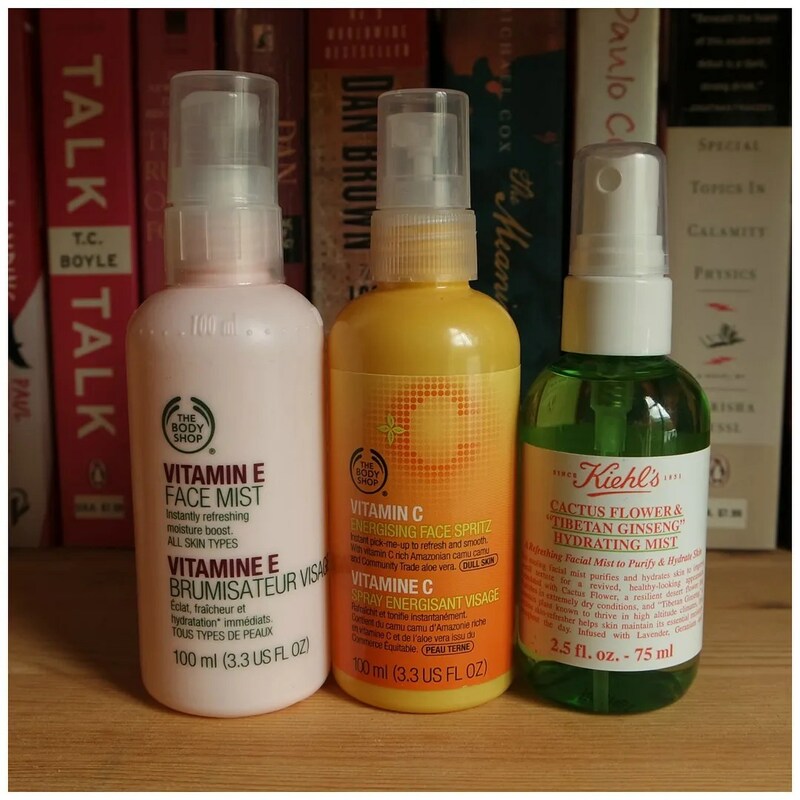 I have reviews up for both the Kiehl’s Cactus Flower Face Mist and The Body Shop’s Vitamin C Face Spritz. If your skin is dry and dehydrated like mine then a face mist is definitely a product I would look into working into your skincare routine. They don’t have to be expensive (TBS has come out with ones that are only €8 a pop for different skin needs) and they truly do something for my skin as well as wake me up right away in the morning. In short, if you have never tried one and your skin can use a bit of extra moisture, then I would highly recommend looking into a face spray. What is your favorite face spray? They are great! Thanks for leaving a comment. I use the one from TBS.. This is amazing! I just got my first face mist and will be using it as part of my skincare routing and use my setting spray for my actual makeup routine. Thanks for sharing! Yeah it’s a great addition to your skincare routine.